I’m so excited to bring you the next project in the Cheap or Free Décor series–this DIY Christmas Card Holder! I’ve been working hard on this puppy for a while. I finished it late one night, and that very next morning we received our first round of Christmas Cards from friends and family. Doesn’t it look festive, all decked out with cards?! 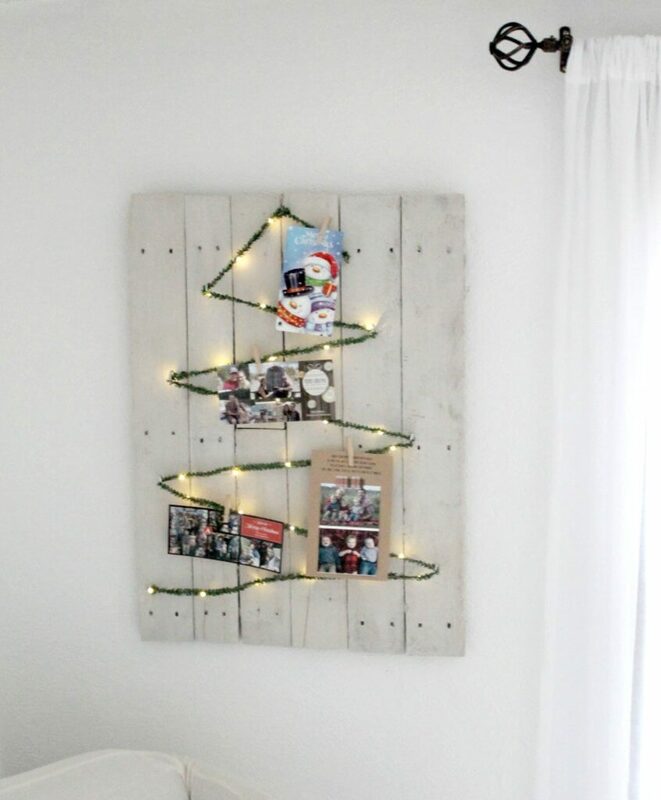 Pallet wood-You can get free pallets from your local lumber yard and assemble them yourself like we did, or you could buy a pre-made pallet board from a craft store like Michaels. Paint- or stain. I used a watered down wash of Miss Mustard Seed Milk Paint in Grainsack, but feel free to use whatever color paint or stain that matches your décor. Eye Hooks- We used 9 for our Christmas tree. You may need more or less depending on how many zig-zags you want your tree to have! 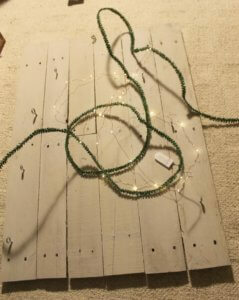 Twinkle Lights- I LOVE these twinkle lights–they are battery operated with an easy on/off switch. Green Christmas Wire: I found my green wire at Hobby Lobby in the Christmas décor with the ribbons. 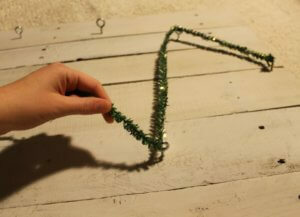 You could get creative and use a small green garland, some twine, even a beaded Christmas garland. Just make sure whatever you use is small enough to fit through the eye hooks. Go ahead and assemble your pallet boards together and tie them in back. You can make yours whatever size you need to fit your décor! Ours is approximately 2’x1.5′. Then its time to stain and paint! Once your board is assembled, it’s time to drill in the eye hooks. If you can tell from the photo, they make a triangle shape and are staggered going down the sides. To figure out placement, I laid yarn out on the board in the shape I wanted, then made pencil marks where the hooks should go. After you have your eye hooks drilled, its time for the fun part. 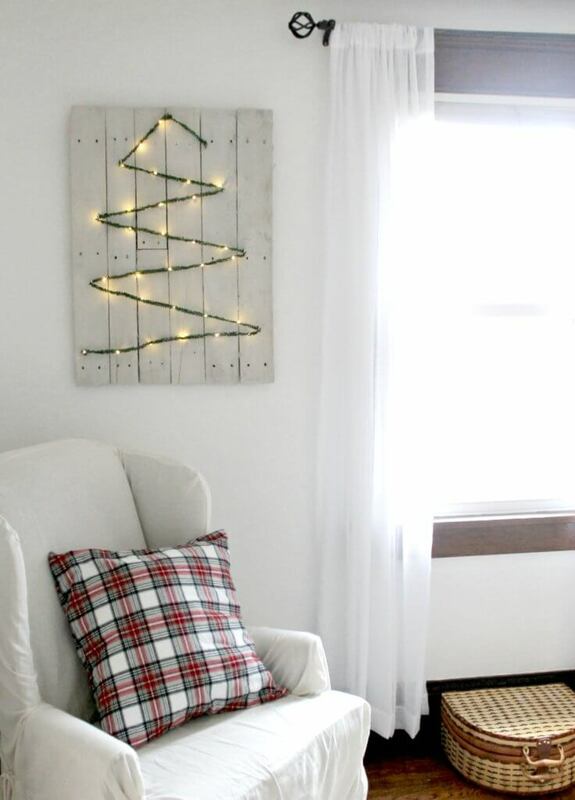 🙂 You will now be weaving your “tree” through the hooks into the Christmas tree shape. This is the part that takes a little patience. Just keep wrapping and threading and zig-zagging until you reach then end. Go ahead and tie your tree off. Just like that, you’re finished! Stand that bad boy up and admire your work. Now for the fun part–grab some mini clothes pins and fill it up with your Christmas cards! Pretty cute, right? 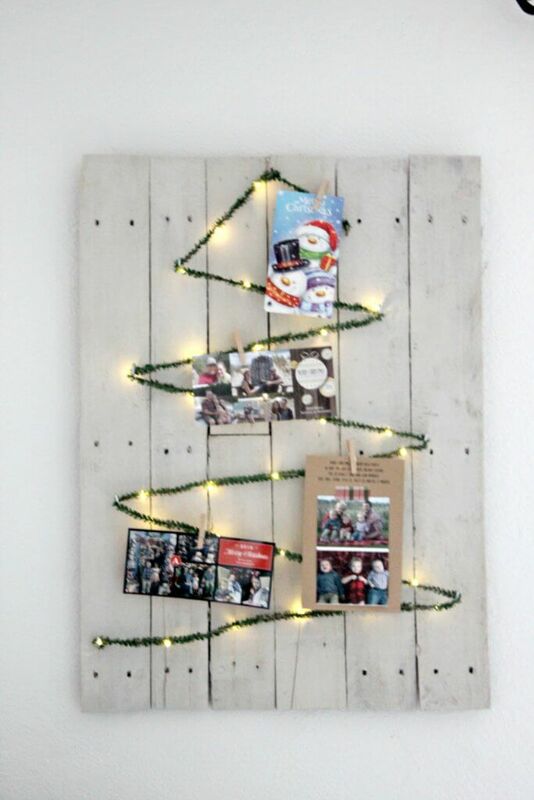 A fun, inexpensive way to display all your cheery holiday cards and add to your Christmas décor, all at once! Hope you guys enjoyed the tutorial! I would LOVE to see photos you guys make of your creations! Tag @thedefineryco on Instagram to share!!! That is such a genius use of the light string! Really adorable idea – thanks for sharing! Thanks Michelle! Aren’t twinkle lights just the best?! So fun to dream up ways to use them!